Obesity often emerges in middle age, increasing risk for metabolic disorders. 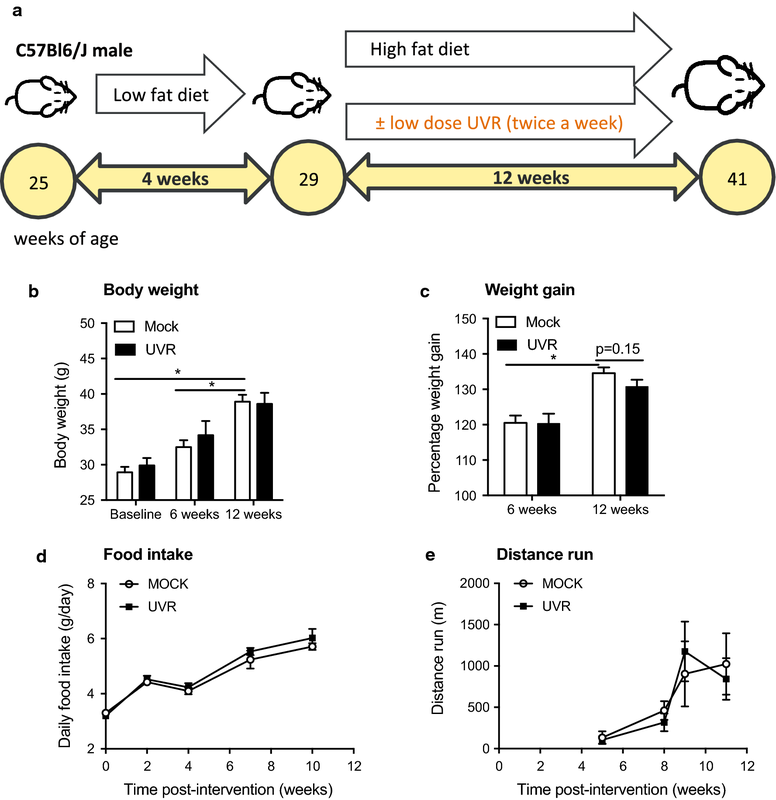 Our previous preclinical experiments identified that chronic exposure to non-burning ultraviolet radiation, like that achieved through sun exposure, prevented weight gain and signs of metabolic dysfunction in young adult mice fed a high fat diet. Our objective was to perform a pilot study to estimate the effect size of ongoing exposure to sub-erythemal (non-burning, low dose) UVB (1 kJ/m2) radiation on measures of adiposity, food intake and physical activity in ‘mature’ adult C57Bl/6J male mice fed a high fat diet for 12 weeks. The severity of liver steatosis, fibrosis and inflammation were reduced in older adult mice exposed twice a week to ultraviolet radiation (from 29 weeks of age), compared to mock-irradiated mice, with some evidence for reduced hepatic mRNAs for tnf and tgfß1 (not fatp2 nor fasN). Power analyses suggested that up to 24 mice per treatment would be required in future experiments to detect a significant effect on some markers of adiposity such as body weight gain. Our studies suggest frequent exposure to low levels of sunlight may reduce the severity of hepatic steatosis induced in older adults living in environments of high caloric intake. With aging populations  and rising rates of obesity in many countries around the world , many people may experience metabolic diseases associated with obesity and aging. In addition to excessive caloric intake and insufficient activity, there may be multiple drivers of obesity and metabolic dysfunction. We are interested in the potential for low dose (sub-erythemal or non-burning) ultraviolet radiation (UVR), like that derived from sun exposure, to affect the development of metabolic dysfunction . We previously observed that long-term exposure to low dose UVB radiation (1 kJ/m2, given twice-a-week) reduced weight gain and signs of type-2 diabetes (e.g. reduced blood glucose measured during a glucose tolerance test) and non-alcoholic fatty liver disease (NAFLD) in young adult C57Bl/6J male mice fed a high fat diet (from 8 weeks of age) [4, 5]. Our studies suggested that some of these effects (e.g. reduced liver steatosis) were dependent on the release of nitric oxide from UV-irradiated skin [4, 5]. Aging affects dermal responses to UVR exposure. For example, skin from older people (77–82 years-old) has significantly reduced capacity to produce vitamin D3 when exposed to UVR . Similarly, body composition changes with age, and increases in fat mass and declines in fat-free mass are accompanied by metabolic changes . Mice develop a more severe metabolic phenotype when high fat diet feeding commences in older age . Therefore, the effects of UVR exposure in older mice fed a high fat diet may be different to younger animals. Here, we report findings of a pilot study done in older ‘mature’ adult C57Bl/6J male mice (from 29 weeks of age) fed a high fat diet, completed to estimate the effect size (if any) of UVR exposure upon highly variable adiposity outcomes, with the goal of using this information to adequately power future studies. We also compared the effects of UVR on signs of liver inflammation in these older mice to young adult mice using archived specimens from our published studies [4, 5]. This study was approved by the Telethon Kids Institute Animal Ethics committee (AEC#238) and was carried out in accordance with the ethical guidelines of the National Health and Medical Council (Australia). Naïve C57Bl/6J male mice were obtained from the Animal Resources Centre (Murdoch, Western Australia). Mice were housed in specific-pathogen-free conditions and kept individually (open-topped cages, aspen chip bedding) with temperature controlled (21 ± 1 °C, mean ± range), Perspex-filtered fluorescent lighting (12-h light/dark cycle) and unlimited access to food and water. One mouse from the UVR-irradiated treatment group was euthanized due to a dermatitis that did not resolve, with all data for this mouse excluded from the dataset. The experiment was conducted between August and December 2015. Mice were fed a low fat diet containing 5.0% fat (not fortified with vitamin D3) for 4 weeks from 25 weeks of age (25 ± 2 weeks, mean ± SEM, Fig. 1a) as diets fortified with vitamin D3 can interfere with the suppressive effects of exposure to UVR . Mice were then fed a high fat diet containing 23.9% fat (not fortified with vitamin D3) for a further 12 weeks. For diet composition (Specialty Feeds, Glen Forrest, Western Australia) see Additional file 1: Table S1. Mice were exposed twice a week (Monday and Friday mornings) to either 1 kJ/m2 (sub-erythemal, non-burning) UVB radiation (UVR; n = 7) or no UVR (Mock; n = 7) for 12 weeks of high fat diet feeding (Fig. 1a) after random allocation into treatment groups. UVR was administered as previously described from six 40 W lamps (TL UV-B; Philips, Eindhoven, the Netherlands) emitting broad spectrum UVR (250–360 nm), of which 65% was UVB radiation (280–315 nm), exposing shaven dorsal skin to 1 kJ/m2 (suberythemal) UVB radiation. UVC radiation (< 280 nm) was blocked using 0.2 mm PVC plastic . During treatment mice were individually housed in a Perspex container. Mock-irradiated mice were then exposed to non-UVR emitting fluorescent lighting and otherwise handled in the same fashion as mice exposed to UVR. Dorsal fur of all mice was removed prior to the first treatment with UVR and then every 2 weeks by clippers. Mice were weighed weekly using a digital scale (0.1 g sensitivity; Scout) every Friday morning in a random fashion. To determine food intake, the amount of diet present in food hoppers was determined using the digital scale, with the mean daily food intake calculated for 4 × 24 h periods (Monday to Friday) . At the conclusion of the experiment, gonadal white adipose tissue (gWAT) and interscapular brown adipose tissue (BAT) was dissected and weighed (0.0001 g sensitivity, Analytical Standard Electric Balance) (3–4 mice/treatment, mock then UVR treated mice). Following humane euthanasia (anaesthetic overload with isofluorane inhalation, done to limit damage to internal structures), the corpses of 3 mice per treatment were frozen at − 80 °C, and thawed prior to imaging using a preclinical MRI (MRS 3000™ Series scanner) at the ACRF Cancer Imaging Facility (Harry Perkins Institute for Medical Research, Perth, Western Australia). 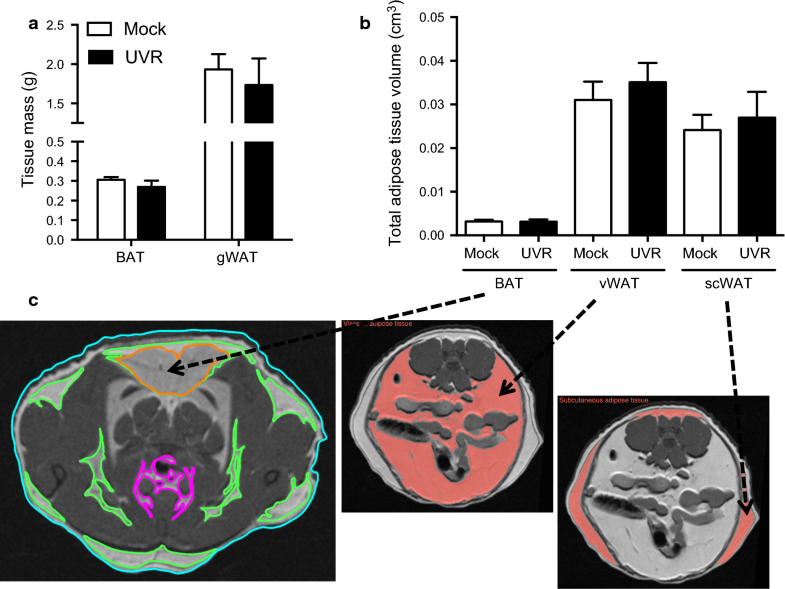 OsiriX Lite Imaging Software (v8.0.1: Geneva, Switzerland) was used to quantify the BAT, visceral WAT (vWAT), and subcutaneous WAT (scWAT) from MRI transversely sliced at 0.1 mm thickness (28 slices, mock then UVR treated mice). BAT was identified by a characteristic hyperintensity in T1-weighted images in the interscapular fat within the cervical and upper thoracic segments . scWAT and vWAT in thoracic and abdominal cavities (neck to tail) were identified as light grey areas superficial and deep to the thoracic or abdominal walls, respectively. To determine volume, the sum of all areas of BAT, vWAT (abdominal and thoracic) and scWAT (abdominal and thoracic) for each transverse cross sectional slice (n = 28) was calculated and multiplied by slice thickness (0.1 mm) . In weeks 5, 8, 9 and 11 of being fed the high fat diet, 4 mice per group were individually housed in a new cage installed with a wireless running wheel (Med Associates Inc., Vermont, USA) immediately after exposure to UVR/mock treatment. Mice had unrestricted access to running wheels until their removal with distance run measured for up to 3 days, with the number of rotations from each running wheel was recorded every 30 s (Wheel Manager Software, Med Associates Inc). NAFLD severity was assessed by blinded-scoring of formalin-fixed, H&E- and Masson’s trichrome-stained liver sections for the degree of steatosis (combined steatosis and hepatocellular ballooning, H&E) and fibrosis (Masson’s) using the non-alcoholic steatohepatitis (NASH) scoring system as previously described [4, 12]. Steatosis (≤ 6) was combined with fibrosis (≤ 4) scores to produce a total score of ≤ 10 (3–4 mice/treatment). Inflammatory foci/field were identified as tight bundles of eosinophilic-staining and multinucleated cells, with the mean number per field (at 20× magnification, H&E) counted in a blinded fashion for 5 fields per mouse (3–4/treatment). Plasma levels of alanine aminotransferase (ALT), aspartate aminotransferase (AST), glucose, triglyceride, and cholesterols (HDL-, (measured) LDL-) were measured at PathWest Pathology, using the Clinical Chemistry kit as part of the Architect c System (Abbot Laboratories, Weisbanden, Germany) for 3–4 mice/treatment. At the end of the experiment, mRNA was extracted from snap-frozen livers of mice (n = 3–4/treatment) with cDNA synthesized and real-time assays performed as previously described [13, 14] using Quantitect Primer Assays (Qiagen, Doncaster, VIC, Australia) for detection of tnf, tgfß1, fatp2 and fasN, with internal primers used for detection of eef1α, the house-keeping gene . We also measured mRNA levels in snap-frozen liver specimens retained from published experiments , in which young adult mice (treated from 8 weeks of age, n = 14–15/treatment) were fed the low or high fat diet (Additional file 1: Table S1), and exposed (or mock treated) twice a week to 1 kJ/m2 UVB radiation for 12 weeks as described in Fig. 1a. GraphPad Prism (v7.0a for MAC OS10) was used to compare data (unit = single animal) between treatments by unpaired student t-tests or one-way ANOVA (with Tukey’s post hoc) or Mann–Whitney or Kruskal–Wallace (with Dunn’s multiple comparison post hoc) tests, depending on whether data was distributed normally, or not (respectively). To compare the effects of time on body weight and weight gain, a two-way ANOVA (with Tukey’s post hoc) was used. The G*Power (v3.1.3 for MAC OS10) program was used to predict the sample size needed for statistically powered experiments, using a two-tailed student’s t test (difference between two independent means, a priori analysis at a power of (1 − ß error) probability of 0.8, and α error probability of 0.05). Results are expressed as the mean +/± SEM (unless otherwise stated) and considered statistically significant for p-values < 0.05. Increased body weight and weight gain was observed for older mice receiving either UVR or mock treatments with time (Fig. 1b, c). However, ongoing exposure to low dose UVR did not significantly modify body weight (Fig. 1b) or weight gain (compared to baseline, Fig. 1c) compared to mock treatment, after 6 and 12 weeks of eating the high fat diet. There was no effect of exposure to low dose UVR on BAT or gWAT mass weighed at the end of the experiment (Fig. 2a). Similarly, exposure to UVR did not modify the volumes of BAT, vWAT or scWAT (Fig. 2b) measured using MRI (Fig. 2c). There was no effect of ongoing exposure to low dose UVR on daily food intake (Fig. 1d) or distance run (Fig. 1e). The severity of liver steatosis and fibrosis were significantly reduced by ongoing exposure to UVR (Fig. 3a, b). No difference was observed in plasma levels of liver enzymes (ALT, AST), glucose, triglyceride or cholesterol (HDL-, LDL-) from mock- or UVR-irradiated mice (Fig. 3c). There was a non-significant reduction in the number of inflammatory foci in mice exposed to UVR, compared to mock-treated mice (Fig. 3d). We also detected non-significant reductions in hepatic levels of tnf and tgfß1 mRNA in both older (Fig. 3e) and younger (Fig. 3f; 20 weeks of age at study end)  adult mice exposed to low dose UVR, with tnf mRNA less frequently detected in the livers of the younger (26/44, 59%) compared to older (7/7, 100%) mice. Levels of tgfß1 mRNA were ≥ tenfold more in the livers of the older (Fig. 3e), compared to younger (Fig. 3f) mice. To explore potential mechanisms by which exposure to UVR reduced liver steatosis, mRNA levels of fatp2 (fatty acid transport protein 2) and fasN (fatty acid synthase), genes central to the regulation of fatty acid transport  and de novo lipogenesis  (respectively), were assessed. Exposure to UVR did not significantly modify fatp2 or fasN mRNA concentrations in the livers of the older (Fig. 3e) or younger (Fig. 3f) mice, although increased fasN mRNA was observed in the livers of the younger mice fed a high fat diet compared to those fed a low fat diet (as previously observed in similar studies ). Sample sizes of 5–24 mice/treatment would be required for adequate power to observe significant statistical differences between mock-irradiated and UVR-exposed mature adult mice for outcomes such as body weight gain, BAT weight, liver histopathology and inflammatory foci and, hepatic tnf mRNA levels; with larger sample sizes needed for other outcomes (Additional file 1: Table S2). This pilot study was conducted to estimate the effect size of UVR exposure upon signs of adiposity and NAFLD in mature adult mice fed a high fat diet. Our power analyses suggested that sample sizes of up to 24 mice/treatment might be required to observe significant effects of low dose UVR on some outcomes, which could be feasible to achieve in terms of animal management and cost. However, it would more difficult to fully power experiments for outcomes requiring ≥ 99 mice/treatment (e.g. gWAT weights). Even with only a small number of mice per treatment, we observed significant effects of ongoing exposure to low dose UVR in reducing signs of NAFLD in the mature mice fed a high fat diet, including reduced hepatic steatosis and fibrosis, and non-significant reductions in inflammatory foci and levels of tnf (pro-inflammatory cytokine) and tgfß1 (pro-fibrotic cytokine) mRNAs, which both promote the development of NASH . These results are consistent with our earlier findings [4, 5] and those of other groups . Reduced signs of liver steatosis were not linked with reductions in the expression of mRNAs of genes governing free fatty acid uptake (fatp2) or de novo lipogenesis (fasN), with further studies needed to identify mechanism(s) by which exposure to UVR regulates lipid accumulation in the liver, such as through enhanced free fatty acid ß-oxidation . 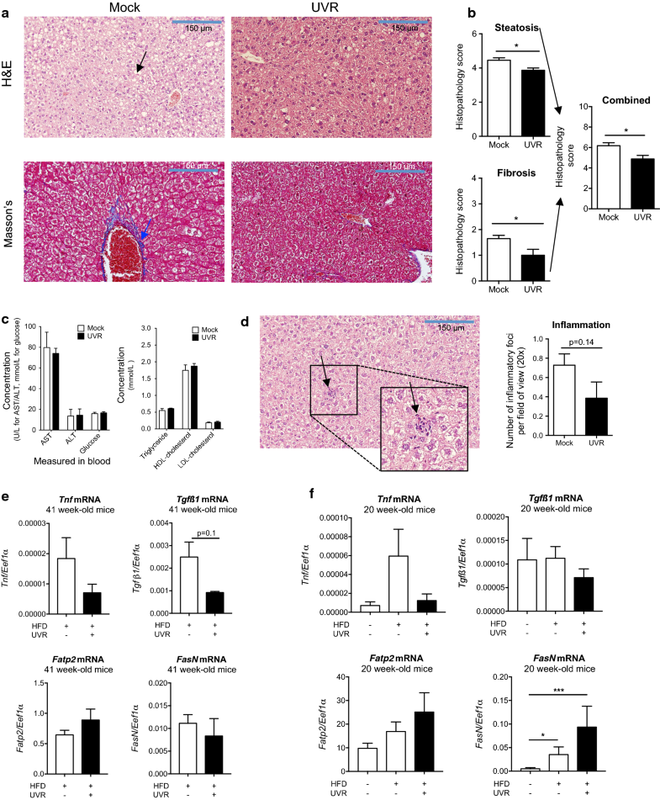 It is likely that increasing age contributed significantly towards the induction of fibrosis and inflammation, as older mice can exhibit increased hepatic macrophage infiltration, serum liver enzymes, and liver mRNA levels of tgfß1, tnf and other pro-fibrotic and -inflammatory genes in mice fed a high fat diet . Importantly, for this investigation we focused on sub-erythemal (non-burning) doses of UVR, which present as low risk for negative health outcomes otherwise associated with UVR exposure (e.g. skin cancer). Further fully powered experiments are needed to demonstrate how these benefits might occur through more comprehensive quantification of hepatic steatosis (e.g. through Oil-red O staining, measuring hepatic triglyceride) and by examining the effects of low dose UVR on other measures of adiposity and glucose dysfunction (e.g. glucose tolerance tests) in mature and older mice with diet-induced obesity, with an eye towards translational studies in the future in humans. Distance run was not measured in fully ‘trained’ mice. ST managed the experimental animals, performed the treatments and assays, completed data analyses (for MRI adipose tissue volume), collated experimental data and helped draft the manuscript. LC and NF assisted with collecting experimental data and performed histopathological assessments of liver specimens. SG envisaged and planned this study, helped ST complete the experiment, performed the real-time PCR assays, conducted statistical analyses and wrote the manuscript. All authors contributed to the editing and completion of the manuscript. All authors read and approved the final manuscript. Thank you to: Ms. Maxine Crook (Princess Margaret Hospital Pathology, Subiaco, Western Australia); Mr. Luke Berry (Telethon Kids Institute) for preparing the histological liver sections; Ms. Nicola Sawyer and Ms. Michelle Lewer (PathWest, Royal Perth Hospital and QEII Medical Centre) for performing the plasma measures; and, Mr. Lincoln Codd from the ACRF (Australian Cancer Research Foundation) Cancer Imaging Facility (Harry Perkins Institute for Medical Research, Western Australia) for acquiring the MRI data. This study was approved by the Telethon Kids Institute Animal Ethics committee (AEC#238) and was carried out in accordance with the ethical guidelines of the NHMRC (Australia). This research was supported by the Rebecca L Cooper Foundation, the Diabetes Research Foundation of Western Australia, the Department of Health of Western Australia, the University of Western Australia and the Telethon Kids Institute. The funding bodies did not play any role the design of the study and collection, analysis, and interpretation of data and in writing the manuscript. 13104_2019_4112_MOESM1_ESM.docx Additional file 1: Table S1. Ingredient list of low fat diet (LFD) and high fat diet (HFD) fed to mice. Table S2. Power analysis to determine sample sizes of treatment groups to investigate the effects of exposure to low dose UVR on metabolic outcomes in mature ‘older’ mice fed a high fat diet.